When my two sisters, a niece and some friends came to Rome, we decided to take a day trip to Assissi, as per my sister’s birthday wish. We left Rome after lunch in a hired van, and after a pleasant two hour drive, part of it through the rolling hills of Umbria, we saw Assissi, with its pink hued buildings crowning the top of one of the many hills in the province of Perugia. The sight of this hilltop town can leave one speechless! And there is an aura of peacefulness that envelops Assissi, a peacefulness I began to recall, (from when we visited almost 16 years ago) as we began the climb towards this beautiful town. ﻿The peaceful atmosphere that envelopes this town may very well be because Assissi has been a holy place long before St. Francis and St. Clare. The ancient town of Assissum, so legend goes, grew around a sacred spring which was venerated by the Etruscans and then the Romans and in the 1st century BC, a temple to Minerva, "the Roman goddess of wisdom" was constructed. In the 16th century, the temple was restored and consecrated and became the church of Santa Maria Sopra Minerva, dedicated to the Virgin Mary, “the queen of Christian Wisdom”. In addition to this and the Churches of St. Francis and St. Clare, there are 11 more churches within the town of Assissi. Our driver left us at the courtyard of the Church of Sta. Chiara, and we were to meet him in the parking lot of the Church of St. Francis of Assisi at the other end of town. 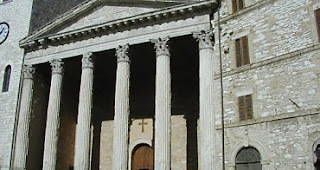 The church of Sta. Chiara is dedicated to St. Clare, a follower and friend of St. Francis and the founder of the Order of Poor Claires, or the Sisters of St. Claire. This order is very familiar to ex-convent school girls like me who continue to send eggs to the Sisters of St. Claire when there is need to ensure good weather. The facade of the Church is made of horizontal bands of pink and white Assyrian marble and right at the center is a rose window. 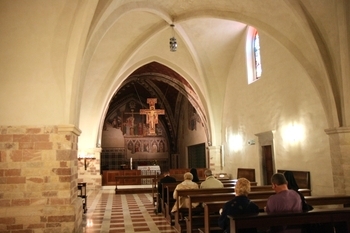 On the right side of the main nave, one sees the Oratory of the Crucifix, a chapel that contains the miraculous 12th century crucifix of St. Francis. Underneath the church is the crypt which houses the preserved body of St. Clare, her face protected by a wax mask. When we entered the chapel it was raining heavily, but by the time we came out, the rains had stopped and the sky was beginning to brighten as the sun struggled to emerge from behind the clouds. Beside the church is a terrace-like veranda, where we lingered for a while looking down on the surrounding countryside as well as getting a glimpse of the lovely stone houses of Assissi. Walking through this very picturesque town is an experience that one doesn't forget. The narrow cobbled stone streets, crowded in on both sides by quaint, charming stone houses, alluring coffee and gelato shops, unexpected corners selling art work and small, cramped shops selling items of Assissi embroidery, (a form of counted thread embroidery practiced in Assissi since the 13th century), hand painted pottery, tiles, plates and religious articles galore. Meandering through these streets was a treat, but the best was yet to come! Reaching the topmost part of the town, one catches a panoramic view of the Church of St. Francis, it literally took my breath away! 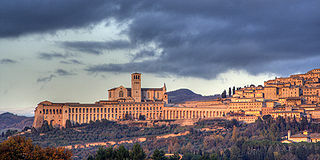 The Papal Basilica of St. Francis of Assissi is the mother church of the Order of the Friars Minor, the Franciscans. It is one of the most important pilgrimage sites for Catholics and has been a Unesco heritage site since 2000. The Basilica is composed of three parts, the upper church, the lower church and the crypt, that contains the remains of St. Francis. The upper church is done in early Gothic style, with it's towering spires and rose window. Both the upper and lower churches are decorated by frescoes from such Italian masters like Giotto and Cimabue. (Unfortunately no picture taking is allowed inside the Basilica.) We walked the whole length of the upper and lower churches and then proceeded to the crypt, in the center of which the remains of St. Francis, in a simple wooden box are venerated. 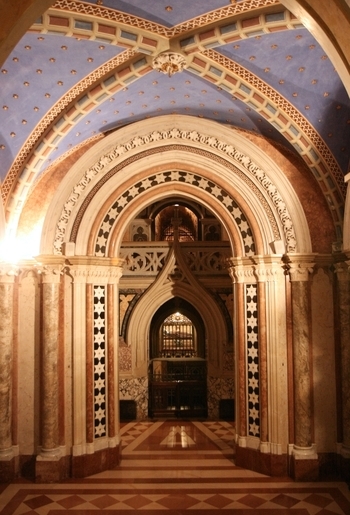 The atmosphere of the crypt was one of reverence and respect, people sat on the benches or knelt on the pews in silence or speaking in hushed tones. In one corner sat a Franciscan friar, whom I approached and asked about having a mass said for my sister, whose birthday it was that day. By the time we had all gathered at the parking lot of the Basilica, the sun was already beginning to set and we reluctantly got into our van to begin the almost 2 hour journey back to Rome. But before we could begin the downward drive, we had to stop at a traffic light to allow visitors on their way up to pass on the narrow one way street, giving us a last glimpse of the houses of beautiful Assissi.